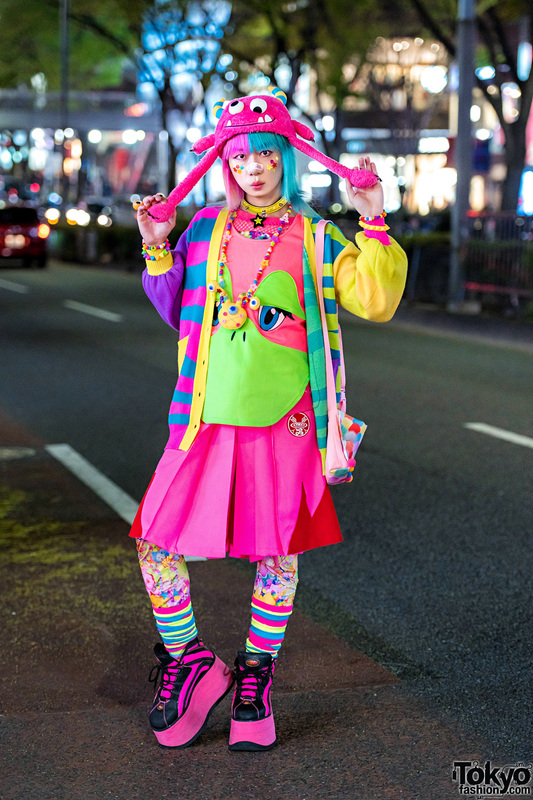 Standing out in the Harajuku street one evening is Junnyan, the longtime Tokyo street style personality and organizer for the world famous Harajuku Fashion Walk event. 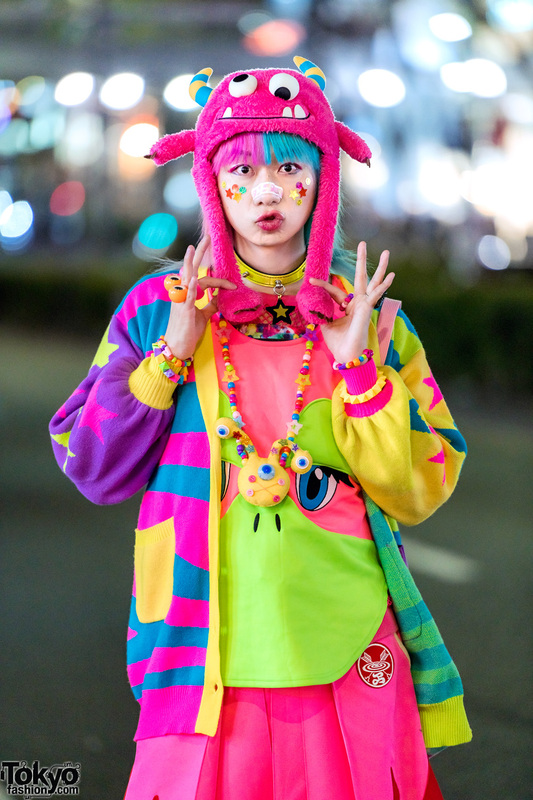 Sporting a fuzzy pink monster cap on top of his blue-and-pink fringed bob, Junnyan is wearing a multicolored stars and stripes colorblock cardigan from Galaxxxy, worn over a duck face pink-and-green top with a pink inner mesh top, both of which are also sourced from Galaxxxy. 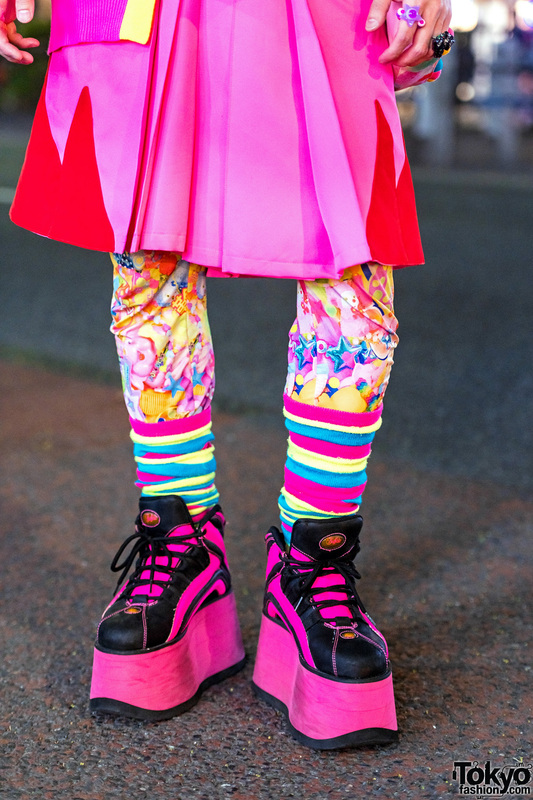 They paired their layered tops with a pink-and-red pleated skirt from Takuya Angel, and wore it over multicolored graphic print tights. 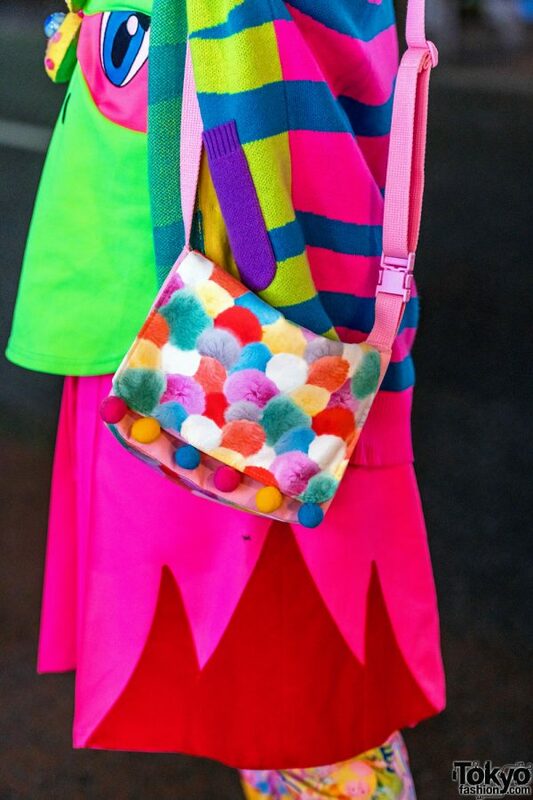 Striped socks, pink-and-black platform sneakers from Buffalo, and a handmade pink pom pom print sling bag with pom pom ball fringes completed their colorful look. 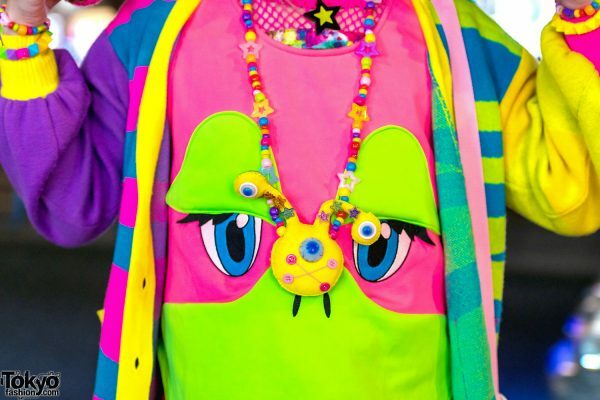 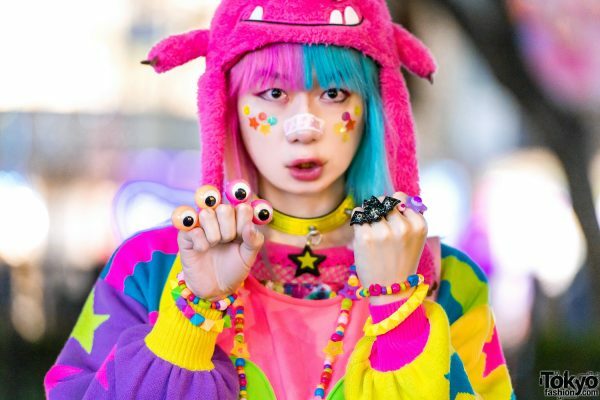 Adding pops of details to their outfit are handmade accessories such as a yellow star pendant choker, a beaded googly-eyed monster necklace, multiple beaded bracelets, a googly eyes knuckle duster ring, and a glitter bat ring. 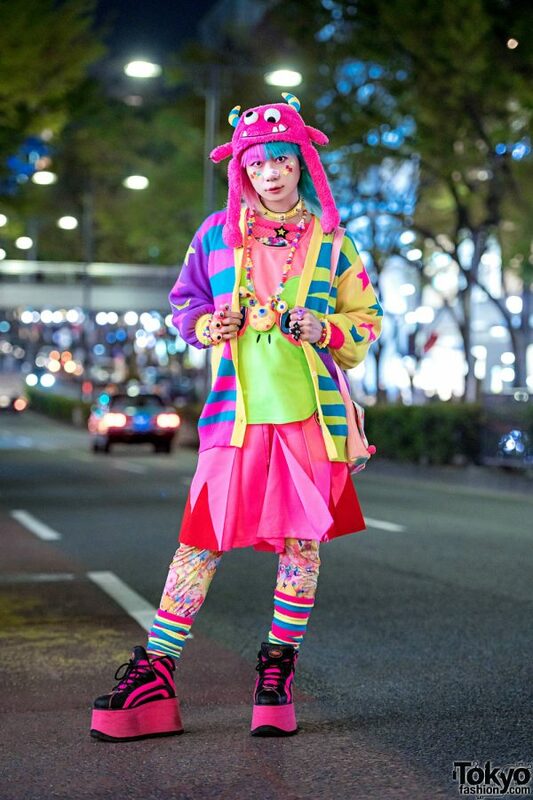 Colorful geometric-shaped face makeup rounded out the organizer’s colorful street style. 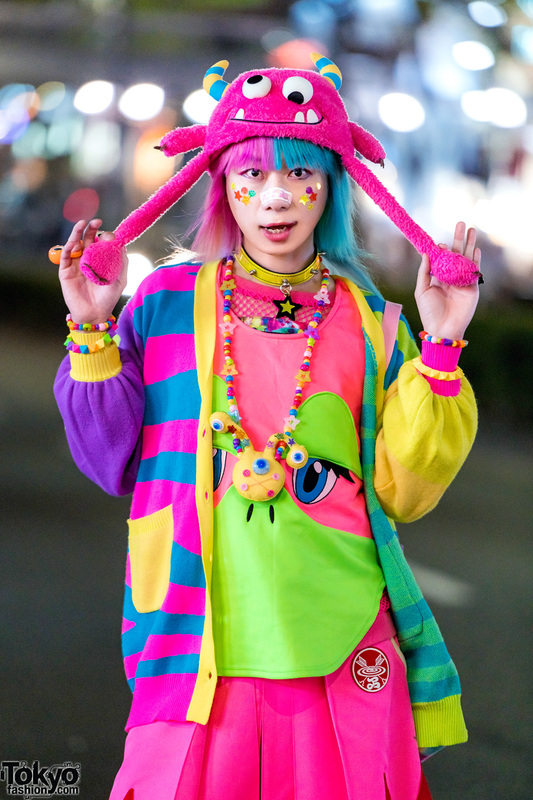 Junnyan loves the music of Japanese singer/songwriter, Miyavi. For their social media updates and style feed, follow Junnyan on Instagram, Twitter, Facebook and Tumblr.